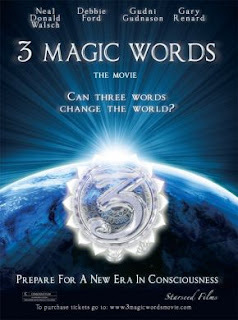 3 Magic Words Movie : Spiritually Uplifting ! It doesn't matter what religion you are, the color of your skin, or the country you were born in. What does matter is how you use this wisdom to enjoy the human experience and the adventure of being alive. Some material in this movie '3 Magic Words', may be spiritually challenging. An open mind is advised. Is there one cosmic energy force that is the source of all consciousness? Does it connect us to each other, to the Earth and to the entire Cosmos? Is all energy simply just energy without any intelligence whatsoever or is all energy imprinted with consciousness? 3 Magic Words is a new movie that explores the metaphysical realms of time and space and presents a new way for people to see themselves beyond their physical existence. The movie takes you on a magical trip into consciousness at both the micro-cosmic and macro-cosmic levels as it taps you into a communion with the very fabric of the energy within all things. There is a discovery that happens when you commune with this cosmic source. It is a shift that can occur in each individual to the realization that we are active co-creators and participants in all of creation itself. This film is a transformational experience and can change your life and your view of the world. If just 1/3 of the population shifted to a higher consciousness we can change the world. Discover the power of the 3 Magic Words and you can achieve a higher awareness of who you are and increase your creative power as a spiritual being in a physical body. Why is this important? Why would you want to achieve a state of higher consciousness? This is a crucial time in our spiritual evolution where war, religious sectarianism and racial discrimination are becoming tiresome to many. People are too attached to their color, their religion and the country they were born in. Separation consciousness seems to be the only thing they know. People have been preaching oneness and love since the beginning of civilization but it doesn’t seem to be affecting things on the collective consciousness. So what is the solution? How do we unite with each other like we’ve never done before? Can just three words bring people together into unity consciousness? Through our words, we can consciously attune ourselves to that Infinite Power of the Universe. Our body is really just made up of condensed energy and is an expression of first thought. The conscious focus of our thoughts into words and spoken with firm will to the universe can be used by anyone regardless of their religious affiliation. The power of thought, (the power of words) and how to use them with our strong will can create our reality. As human beings, we are different from the other forms of creation: we have the freedom to use these magnificent powers of thought and energy to create in the physical world. We can use the same power that created the universe to create our reality. The 3 Magic Words are a signpost to help you apply the universal forces of creation to your life. The 3 magic words are the science by which we can attune the human mind and will to the consciousness of the universe. But you can’t just speak the three words and expect a miracle to happen. The movie can show you how to develop your will so it is in tune with your soul’s purpose and you will understand the 3 Magic Words on a level that goes beyond the words themselves. Then you will see the true miracle of who you are and you can control your destiny. What three words can do all that? The universe is vast and mysterious. It contains all that ever was or will be. Our earliest ancestors with their ever-evolving minds could never have imagined the border-less expansion of the cosmos that has revealed itself to mankind’s probing eyes. Armed with our newly invented tool, called science, we’ve begun to unravel some of the countless mysteries that have puzzled us through the ages. It’s nothing short of a profound mystery that in this limitless sea of space, filled with enormous galaxies, containing over 800 billion suns, life has emerged at all. But emerge it has. Somewhere in a tiny little corner of an ordinary galaxy, filled with billions of ordinary stars, there is a tiny blue planet, suspended in the black of space. This minuscule world is home to a peculiar life form called HUMAN. Humans have traveled a long road in trying to understand the purpose of their existence. Humanity has finally reached a pinnacle in its evolution where knowledge, unity and the desire for peace have brought them closer together in solving life’s biggest mystery; Who am I? Why am I here? What is the purpose of human life? 3 Magic Words is an entertaining film that weaves together a tapestry of new age thought, quantum physics, philosophy, world religions, cosmology, archeology, geometry, and an amazing discovery about the nature of consciousness. This new understanding of consciousness will take us on an adventure of self-discovery and lead us into becoming a more evolved human being so that we can awaken the hidden power that we all have and share it with the world. The 3 magic words are here to reveal an amazing truth about who we are and the power that this realization gives us. It’s a profound concept that is transformational not just for each individual but also for the whole planet. Can Three Words Change The World? If you want to make the world a better place, if you want to make the world more peaceful, cleaner, safer, more breathable, loving and spiritual, the transformation has to start from within. A new era in consciousness has begun. We now know that we live in an eternal universe. We now know about the illusory nature of matter. We will soon discover the true nature of who we really are and the power that we all have. It is time to realize our divine connection to the Universe and discover the spark within us that is pure consciousness. What three words can we speak to reprogram our subconscious mind? What three words can we use to experience a positive appreciation for everything that we have, live in the present moment and give us the feeling of total joy and happiness? What three words are in divine agreement with our soul purpose? If you are not your name, your personality, or your mind; if you are not just a bag of flesh and bones… then who are you? Imagine being able to consciously direct your thoughts, overcome limiting beliefs, fears, negativity and pain. Imagine leaving the past behind and living in the present moment, feeling complete happiness and peace as a co-creator or your destiny. Imagine loving your life. Imagine loving yourself. At the very core of your being you are the great universal consciousness that exists in all things and you can tap into that part of yourself that knows everything and is everything. The human mind has extraordinary powers and you can tap into these powers to live the life you were meant to live. When your thoughts, words and actions are in alignment with who you truly are, you will start enjoying each moment. You will stop judging other people. You will no longer see anything as a conflict or worry. You will develop a new appreciation and always feel a divine connectedness with others and with nature. You will let things happen rather than trying to make them happen. You will have an overwhelming feeling of love for all beings and all things on the planet. Once you awaken to this new understanding, you can shift your perception and shift your consciousness. It is not an issue of whether or not we CAN make a difference. We DO make a difference. Everything we do, say, and think shapes our reality. The 3 magic words are here to lift you into a higher consciousness that will change the way you live your life and change the way you see the world. They can help you to open your eyes and finally see your connection with the All. They will awaken you to the reality that we are all one and when we kill others we kill ourselves. You will realize that what we do to the Earth we do to ourselves. You will understand that we are the nature and we are the land…and you will know without a doubt that we are living breathing sentient aspects of the entire cosmos. Are you ready for that? where is the movie ? . a paradise then what the hell do you need money for?why sell it? what need is there for an obsolete commodity (money),in paradise, where you would have no needs or wants unless you decided to re create them? When would this be available globally... currently all online rentals are U.S. only. Im in Australia.